A performance level winter sports sock that is designed to work with your body, this Bridgedale Control Fit midweight sock offers exceptional comfort and protection, with a mix of Merino Wool and Endurofil™ fibres that provides friction-free heel and ankle panels for easy boot entry and an anatomically cushioned, fine knit high friction padded forefoot that improves control. 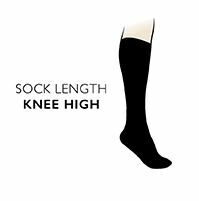 A tapered, triple density shin area improves the sock’s fit and offers 360° cushion protection, while light grade compression ensures leg comfort and care. Knitted tension bands around the arch and ankle improve fit and add more support. The special ‘Woolfusion’ yarn carries a three-year manufacturer’s warranty.